If there was ever a puppy paradise on Earth it may be Ocean Beach, San Diego, California. There are certain communities that cater to dogs more than others. Ocean Beach with its expansive dog beach, multiple off leash dog parks, general dog friendliness, and absolute walk-ability sets a high bar for the most dog friendly neighborhood in the USA. It is also the birthplace of Doghook Inc, a design and manufacturing company that has perfected the modern dog hitch. Dog ownership in the USA is at an all time high, there are approximately 75 million pet dogs in the USA. According to the APPA 42% of US households have a pet dog. Residents of cities and towns around the world, like OB, that embrace the growing dog friendly lifestyle are successfully creating dog inclusive communities in their own neighborhoods. Walking down the street in Ocean Beach you immediately notice that almost everyone has a dog, and people spend a lot of time with their dogs. We take our dogs to work, we take our dogs for coffee, we take our dogs out for dinner. We know that our dogs are much happier when they are with us, and we are happier to have them along. We also know, that at some point during the day, it is nice to be able to put the leash down and have your dog be safe. In Ocean Beach you will notice strange, metal hooks mounted outside of businesses all over town, often with dogs tethered to them. Whether you are grabbing eggs at the corner store, enjoying ice cream with the kids, or having a beer at the pub, a well-placed Doghook can make a dog owners day safer and easier. It is easy to make your town a dog paradise too. 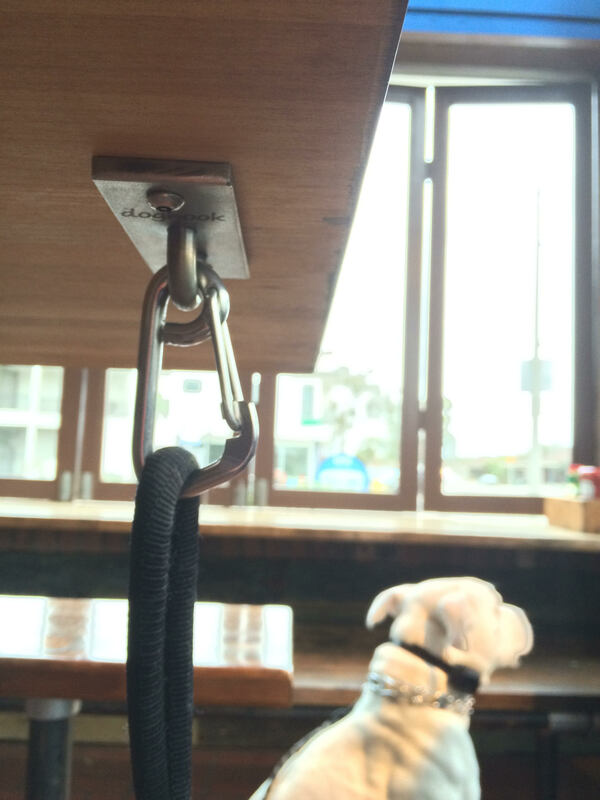 If you own a business where dogs are commonly present, install a Doghook so people can safely and easily hitch a pet. If you want to attract more foot traffic into your business, install a Doghook outside, show customers that you care about their pets’ safety. Talk to your local dog friendly business about dog safety and how to keep our dogs safe!